Two new county-wide websites created by the merger of 11 local newspaper portals have gone live. 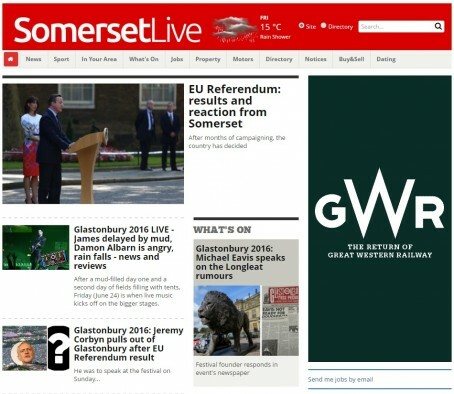 Gloucestershire Live and Somerset Live are the latest two additions to the ‘Live’ brand of websites which Trinity Mirror has been developing over the last 18 months. The consolidation of the 11 newspaper companion sites at former Local World titles in the county into the two new digital offerings was first announced in April, with a net loss of 14 jobs. Somerset Live, below, has now been created from the merger of the websites of the Central Somerset Gazette, Western Gazette, Cheddar Valley Gazette, Shepton Mallet Journal, Wells Journal, Frome Standard, Somerset Guardian and North Somerset Mercury. Meanwhile, Gloucestershire Live is now the online presence Gloucester daily The Citizen, the Gloucestershire Echo and Stroud Life. The website of the Western Daily Press has also been incorporated into that of the Bristol Post, which has retained its name. David Higgerson, digital publishing director at Trinity Mirror, said: “Our aim is to build a digital portfolio which reflects the local lives of our readers. “We are increasingly finding that readers prefer a website where they can everything they need about their local area, rather than having to visit different sites for the different things. “This has certainly been the case in Newcastle and in Plymouth, where the content we are known for producing is now reaching a bigger audience than ever online. The Live brand was launched in Belfast last year with the launch of BelfastLive, and has also been adopted for new launches in Dublin and Glasgow this year too. Similar rebrands are planned for ex-Local World titles in Kent, Essex and Cornwall. Based on this breathless recommendation this morning I suspended my sceptism and typed Somerset Live into Google. Even if you disregard the fact it’s ranked fifth on search, so a long way to go on SEO boys and girls, within seconds of the home page loading it was completely obliterated by an ad for American Airlines. When will those in charge of TM’s digital strategy learn that you start with the user experience if you want to properly build audience, not grabbing the money? Look very much like the old one with a new banner, and they’ve probably just added new some feeds into it. Same dull design. You’re correct hedge cutter so they’ll grab the money from wherever they can,this will primarily be national brands and agency’s as there IS no money to be made online from local businesses, it’s been tried by all the main regional press players and all have failed to lift off, very soon these ‘local’ ness sites will be wholly given over to national brands with only their own filler ads or bundled up package sold ones appearing. The sooner they accept regional press websites can’t be monetised by the local sales people the better. Our TM website takes a creative approach when it comes to the area it’s supposed to cover, a medium-sized UK city. This weekend it presented itself to the world leading with a story about a town way out of the area, albeit in the same county. I was not the only one who immediately went somewhere else for the local news I wanted. So, as ‘Who’s fooling who’ notes, it’s no dice on the ad revenue side and none either in a journalistic way. The future is indeed bright. Totally agree this is a couple of years ago and I went around loads of local businesses trying to get them interested in a local site, not a single one was interested – they had all the exposure they needed over Facebook and Twitter and were fine publishing competitions, vouchers etc for themselves. So we should all give up. Great plan everyone! Soon the papers will be merging. Very surprised the two Gloucestershire websites merged. curious: Typically arch comment with nothing constructive to add. No, we shouldn’t all “give up” but we have to recognise that the age of the corporate news publisher is nearly gone. As several experienced ad reps note above, there’s FA money in local news online. For proof look at TM’s figures in its last annual report, £450m paper, 42.5m digital if memory serves. You can’t run a mega-corp on that. Future lies in small, locally based ops where everyone has all the required skills – the editor can sell ad space and has a turn cleaning the office, etc. For the last time – the dinosaurs are almost extinct; if you work for one get out pronto. Septumus is correct, as are many other people who’ve posted on various HTFP posts, The future really is small independent local news papers and lifestyle magazines maintaining high quality, keeping overheads under control and where everyone plays an integral part of the business, this is easy for those currently in the regionals with nothing to lose and with entrepreneurial leanings but almost impossible for the big four / five crumbling dinosaurs of the U.K. Regional press who are so entrenched with top heavy management structures and laden down with those clinging on to jobs that pay lots but produce little just waiting for that one big pay day for as long as they can. Local news on line sites cannot produce anywhere near enough revenue or saleable traffic to sustain a business so the choices are limited,find an alternate revenue source ( but from where??) or realising they cannot compete with the main national and world news providers close them down altogether thus reducing costs. Ad reps I know,go through the motions moving money from print to online to hit a target irrespective of whether it benefits the poor advertiser or not ( not) or to keep their boss happy,all say they cannot persuade local businesses to spend online as they themselves know it simply doesn’t work.they also know the paper advertisers are also walking away in droves spending their ad budgets with alternate independent publishers due to poor response and ongoing readership losses,the ridiculous and embarrassing bundling up of print with web plus e newsletter readers plus social media numbers is fooling no one and loses what little credibility the big players doing it once had. Most agency business is handled by an internal admin source with maybe one or two commercial people advising them of whats new or any specials coming up but with the decisions to buy based primarily on audience and reach,things the local “ad rep” cannot convincingly communicate to a seasoned uk media buyer. These buyers are attuned to the facts around products rather than the puff and smoke screens put out by the regionals,many who are bundling up print sales,online,facebook and twitter and even e newsletter figures,in an attempt to make their figures look good but losing credibility with media bookers who see right through the misdirection which simply erodes the sales story and draws attention to how bad sales must be if this is being presented as a credible audiecne figure. With costs ever increasing and revenues ever decreasing the time has come to look at whats brought in ,by who and at what cost. once this is analysed along side the reduction in quality and quantity of editorial staff the cloth will be able to be cut accordingly, with savings able to be made in the appropriate areas rather than all coming from the news side of the busienss as is now and has always been the case. cut quality staff and quality content suffers,cut quality content and sales drop,sales drop and theres a weaker offering for the sales people to sell,yet still the sales floors are rammed full of reps,managers and support staff in the same number who were then when busienss was booming,something so obvious to many but ignored by the ones in power charged with making costs savings.